It’s time to add some texture to the slats that will make up the dial of my clock. An a previous project I ran similar strips of pine over a wore brush prior to finishing and I was generally pleased with the results, but I recall it taking a crazy-long time to get the depth of texture that I desired. Recently I’ve been catching up on a backlog of videos by Jimmy DiResta and in one he torched and then wire brushed similar pine boards and it was clear that I had my solution. The Japanese call this “Shou-Sugi-Ban”, and there they use it as a finish for exterior cedar siding. Google it because it is fascinating. 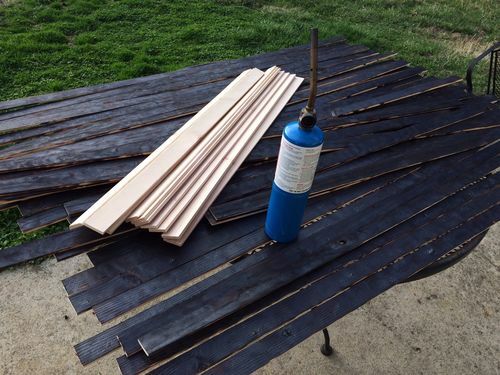 So I gathered-up my slats and took them to the back patio along with my propane torch. Initially I just toasted them, which gave them a nice brown color, but then I remembered that adding color isn’t what I’m after; I need the wood to fall-away when I wire brush it. So with a little trepidation I let it rip. Is it odd that the songs “Disco Inferno” and Kansas’ “Fight Fire With Fire” played continually in my mind for the two and a half hours that it took to roast the wood? Returning to the shop with my scorched wood my next project was to add a wire wheel to “stock feeder”. A couple years ago I had a project that required me to accurately route groves in a thousand + feet of lumber, and though I couldn’t justify the price of a stock feeder I could justify purchasing an inexpensive portable planer. I removed the blades, built a dedicated bench with a long, continuous bed and rigged an overhead router that together with the planer as the stock feeder made short work of the project. 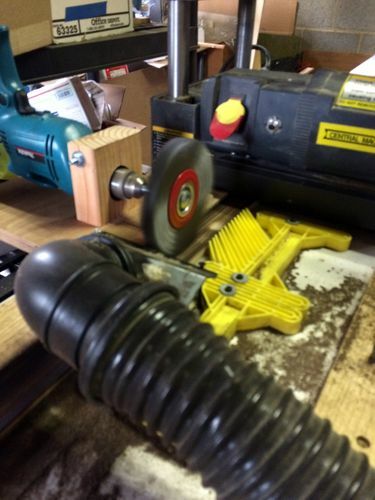 I fabricated a mount for my drill and cobbled together a mandrel from a carriage bolt and away we went. All in all about 340 liner feet of this charred pine made two trips under the wire wheel, and the results look good. Want to hear the odd part? Next we paint the wood white! That’s cool. 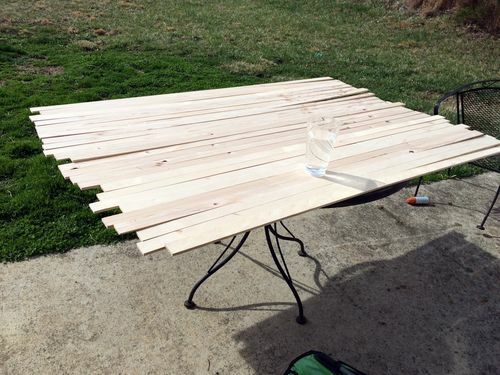 My first ever proper project I made (http://lumberjocks.com/projects/93307), I burned the top of my pine coffee table. I have no idea where I even came up with the idea, as I had no experience in the field. I just thought it’d be a good idea. Didn’t burn it as thoroughly though since i didn’t want the texture, i just wanted the look. That s cool. My first ever proper project I made (http://lumberjocks.com/projects/93307), I burned the top of my pine coffee table. I have no idea where I even came up with the idea, as I had no experience in the field. I just thought it d be a good idea. Didn t burn it as thoroughly though since i didn t want the texture, i just wanted the look.